I LOVE her online shop! The prices are affordable and the pieces are GORGEOUS. 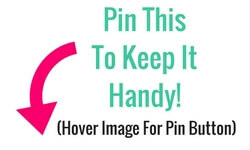 Plus she is offering us $5 off $35 when you use FIGHTTHEFRUMP at checkout! All three outfits are based on the Full Year Wardrobe Outfit Guide and all the pieces are in the Full Year Wardrobe Plan! 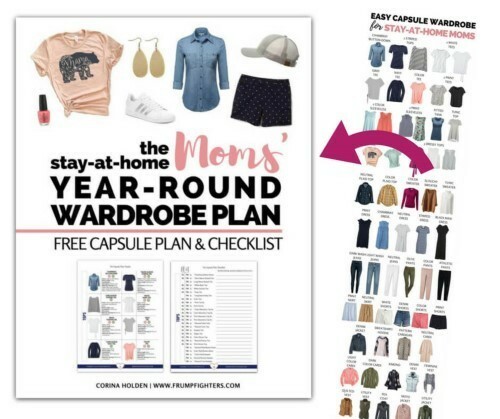 This is the free plan I created that covers all the foundation-pieces every mom should have in her wardrobe! If you feel stuck in a yoga pants + tee rut, this will help you explore new mom-friendly fashion! You can download it by clicking the button below. It will give you a 20% discount to the full outfit guide. The full outfit guide gives you 239 outfit ideas spanning the whole year. I'm Amy; Wife, mom of two precious little girls, and online boutique owner. I love Jesus, cooking, the beach and making beautiful things whether it’s decorating cakes, creating amazing outfits or crafting. I’m a transplanted mid-westerner who feels right at home in the heart of the South. My mission is to make the lives of women better by sharing the Lord and helping them see how beautiful they already are while showing them that fashion can be simple and fun. Hi ladies, I'm Amy Sandridge, the owner of Field of Lilies Boutique and I am honored to be guest posting today. My online boutique offers exquisite children’s clothes and on-trend, versatile pieces for women. 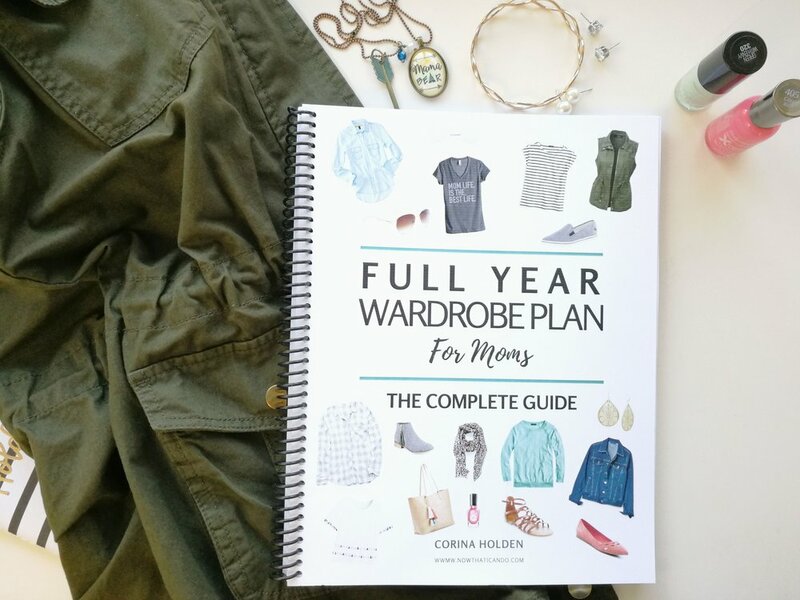 I hand-select (and in some cases design) each piece of clothing in my store, and most of the pieces in my store are a great fit for Corina’s Full Year Wardrobe Plan for Moms. My mission is to make beautiful, functional fashion easy. I found Corina’s Spring and Summer wardrobe plan last year and was drawn to the color scheme and the idea that owning strategic pieces could allow me to own less clothing but have more outfit possibilities. I must say that after purchasing Corina’s program it actually changed my life! It has made shopping and getting dressed every day fun and easy. Today I would like to show you how to create 3 chic, comfortable and mom-friendly outfits from the Full Year Wardrobe Outfit Guide (FYW) using pieces from Field of Lilies. The first look I have for you is the perfect outfit to wear to church or out for a meal with friends and family. It is based on Outfit #10 from the FYW (Full Year Wardrobe Outfit Guide). We will begin with Field of Lilies A-Line Black Dress. This dress is made from the perfect super soft knit, and the A-line silhouette flatters every figure. The Women's Denim Jacket and Leopard Print Scarf are great layers to add for warmth and style. The jacket is made from soft denim with a nice amount of stretch and features some distressing, and the scarf is sewn from lightweight chiffon. To finish off your look, add the Hammered Silver Necklace and Earrings Set and Rose Druzy Bracelet, a pair of ankle boots and your favorite tote bag to look effortlessly chic. The next outfit I would like to share with you mixes stripes and plaid to give you a put-together look perfect for shopping or family outings. Based on Outfit #30 in the FYW, this outfit begins with the Women's Striped Rounded Hem T-Shirt Dress. This dress is made from a stretchy, comfortable knit and features a flattering rounded hem and a patch pocket to add interest. Now let’s add a pair of Soft High Waisted Black Leggings and a Women's Utility Vest to keep you warm on cooler days. The black leggings are ultra stretchy and comfortable and the high waist means they stay put. Our utility vest is soft and has a cozy faux-fur lining. Accessories are so important to capsule wardrobe plans because they can completely change the look of an outfit. For example, you can add our super soft Plaid Blanket Scarf and completely transform your outfit. The jewelry from our previous outfit works as a great finishing touch for this outfit as well. Just add a pair of riding boots and tote bag and you have an outfit is ready for whatever your day brings! The final outfit I want to share with you begins with a tunic and leggings, my favorite combination for fall. I paired our Cream Layered Look Shirt with our Black Moto Leggings. These pieces have so many beautiful details. The shirt has layers of chiffon and lace at the bottom and graceful bell sleeves, while the moto leggings have edgy pleating and gold zippers at the ankles. Both pieces are flattering as well. The shirt has a great tunic length and a flowy fit, and the leggings do a good job of holding everything in. Now for the accessories: our Light Gold Teardrop Earrings and Leopard Print Scarf add a touch of glam, and our Women's Utility Jacket or Plus Size Women's Utility Jacket add visual interest and warmth. Just add your riding boots and crossbody bag and you have an outfit that will serve you well, for any casual occasion. Looking stylish and put-together doesn’t have to be hard. The full year wardrobe plan is an amazing system of building a wardrobe you will love. I hope you will check out my online boutique at www.FieldofLilies.com or find us on facebook at Field of Lilies Boutique Group to choose some pieces to complete your wardrobe. Thanks! Amy's last outfit was inspired by Outfit #45 in the Full Year Wardrobe Outfit Guide (pictured below). You can get all 239 outfits if you grab your copy today! Comes as digital eBook + online gallery of outfits, with option to add print after purchase. 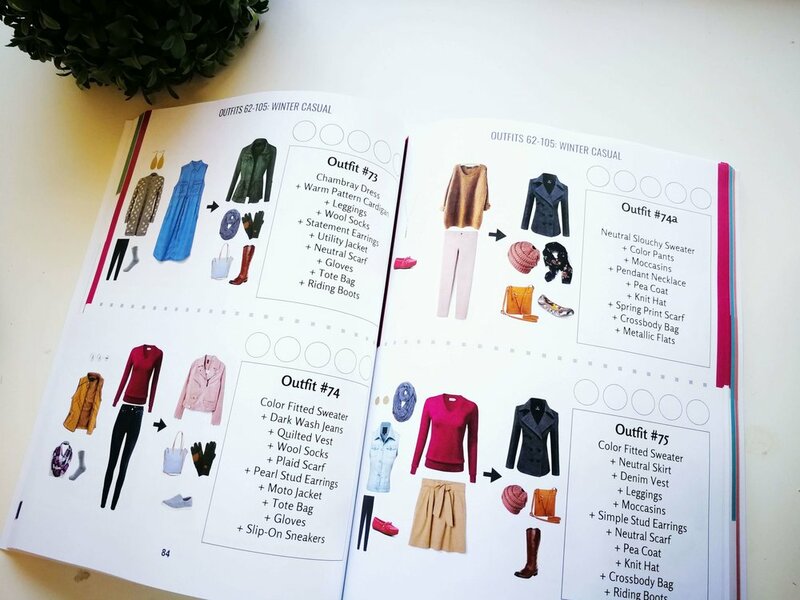 Subscribe to the Full Year Wardrobe Plan by clicking here and get 20% off the Outfit Guide! Use code FIGHTTHEFRUMP at checkout for $5 off $35! What Was the Full Year Wardrobe Amy Was Talking About? It's a list of foundational pieces for a mom's wardrobe. If you're ready to get out of the yoga pants + tee rut, this is for you. The plan is free! Click the button to download it. You'll also get a 20% discount to get the full outfit guide with all 239 outfits!